When you visit Gatlinburg, you definitely want to see all of the attractions you can. We know that sometimes it gets pricey to buy tickets for everyone to everything, especially when you’re traveling with a large group. That’s why we’ve put together an easy way for you to save money and see the best attractions in the area! Take a look at our Family Fun Pass! With every paid night’s stay, you will receive one complimentary ticket, absolutely free, to each of these attractions. There’s no strings attached. Just make sure you use them each day because they expire and the end of every day. We recommend choosing attractions you plan to visit, setting up a schedule, then calling and making reservations with your free Gatlinburg attraction tickets. There’s so many things to do when you visit the Great Smoky Mountains National Park. 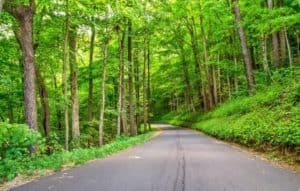 Whether you’re looking to take a driving tour or go hiking in the mountains, there’s over 800 square miles of natural forestry that’s perfect for getting away for an afternoon. Plus, hiking in the Smoky Mountains is absolutely free–can’t beat that! When you go hiking, be sure to arrive early. You don’t want to be stuck on the trails late at night, so the earlier you get out, the better. Don’t forget to pack plenty of water. There’s water sources in the national park, but those sources are filled with bacteria. The water from rivers, streams and waterfalls is practically guaranteed to make you sick, so just stay away! It’s so much easier to pack your own bottled water (or pick some up at one of the visitor centers before you start your hike)! Pack emergency supplies! Many families who take an adventurous day to hang out in the national park typically forget emergency supplies. While it’s highly unlikely that you’re going to need them, you don’t want to be stuck out on the trails without them. Little things like band-aids, a compass and matches can make a huge difference when you really need them! Of course, we always recommend dressing in layers when you go hiking in the Smoky Mountains, but the sun is shining and it’s hot outside—so the last thing you want to do is dress in layers, right? Well, let us explain. Even though the sun is shining bright while you’re hanging out at your cabin in Gatlinburg, the temperature in the upper elevations or in the shady areas of the national park may be a little lower–or even quite a bit lower. If you’re taking a hike where you hike to upper elevations, it’s a good idea to pack at least a light jacket…just in case! You deserve a break, but just because you need to catch up on a little R&R doesn’t mean you have to sleep the entire time you’re on vacation. Just spend time doing what you want to do, and relax while you’re at it! Stop worrying about having a schedule and what’s happening next. Just spend a few hours enjoying the peace and quiet of the mountains. Our Gatlinburg cabin rentals are packed full of great things to do, so when you’re relaxing at the cabin, you can feel refreshed and excited to hit the town the next day. With everything from home theater rooms so you can curl up and watch a movie to game rooms and gaming tables where you can challenge your friends and family members all night long, there truly is something for everyone who will be with you! Start planning your vacation today!